Black son of Buckeroo 29"
Our 3rd Buckeroo son was an opportunity we couldn�t pass up. Yet again we refine our breeding program with this awesome stallion. A Double Registered 29 inch solid black son of Buckeroo. 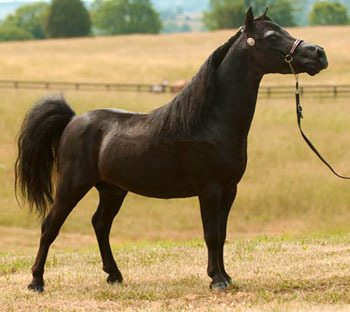 Merlin is a halter champion and sire of many supreme champions. Merlin's dam was bred to Buckeroo four times. The Eberth's must have liked what they saw in that cross as it seemed to be a good one. Merlin is full brother to Little Kings Buckeroo Icon, a World Champion Senior Stallion who has already sired multiple World Champion foals himself. Merlin's dam is a favorite at Little King Farm. In addition to Buckeroo, she's been bred to BTU, Psyched Up Buck, Buckeroo Zodiac, Fishers Master Mickey and Stouts Supreme. Thank you to Parmela of Star Ridge Acres for allowing us to add "Merlie" to our breeding program. 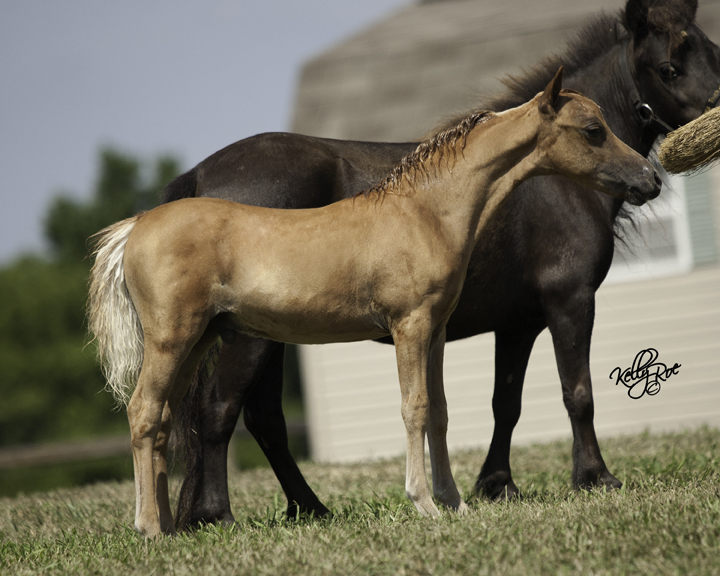 This beautiful buckskin filly arrived May 5th. 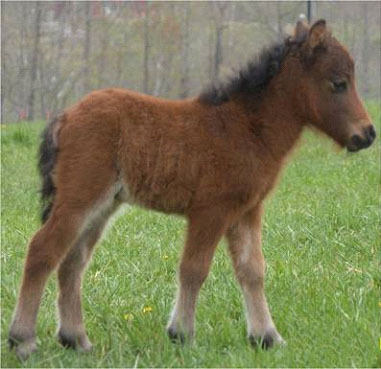 She�s tiny with the dishiest head her sire puts on all his foals. 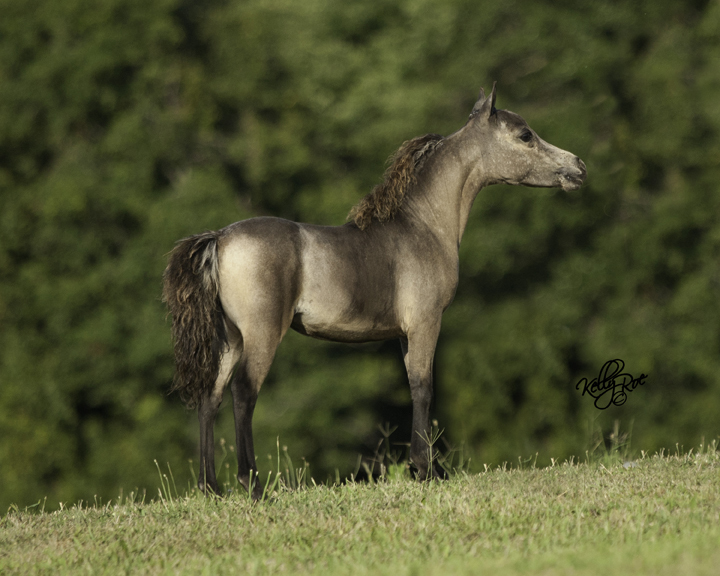 Her dam is a beautiful 32 inch sooty buckskin, a daughter of a true blue roan who is a 2006 World Champion driving horse, Six Gems Roan N Out Blue. Her dams pedigree includes Rhotens Little Dandy, Stouts and Dell Teras. Her sire is our beautiful palomino BTU son, Rogers HSR IMA BT standing at just 29 inches tall making this foal a BTU grandson! While BTU should need no introduction, this pedigree carries Buckeroo, Top Cat and others. It�s been publicized lately that BTU is no longer siring offspring so consider owning this filly to carry on the legacy BTU so successfully earned. 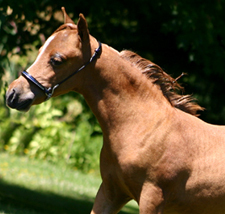 This is a dainty and feminine buckskin filly with a very dishy and petite head. Willing to sacrifice for 2,000 to the serious buyer. If you're serious, we'll let you decide her name after our prefix. This beautiful Cremello double-bred Buckeroo filly with two crystal blue eyes arrived on 5-11 and is one we�ve been waiting for by our very own Woody granddaughter. She didn�t disappoint us either. This filly has an impeccable pedigree of well known bloodlines and champions. Her grandsire is Majolicas Leatherwood Trigger, (now resides in France) is one of only 6 sons born to Little Kings Leatherwood Buckeroo �Woody�. Woody will be remembered in the miniature history books as one of the greatest producing stallions of all time. 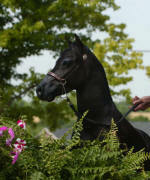 He�s also full brother to the World Grand Champion Stallion Little Kings Buckeroo Baccara. 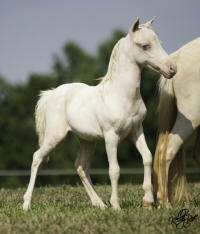 Then of course her sire is a Buckeroo son making her a Buckeroo granddaughter. Her granddam SG Angel in Blue is Gold Melody Boy AND double Blue Boy bred. Electro is also Blue Boy on his dams side. That�s a lot of royalty running through her veins and she�s got the looks and conformation to back it up � take a close look at this filly as she�ll be offered for sale to the discriminating buyer. 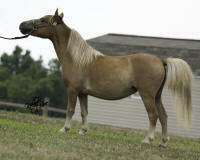 On 5-19-11 we welcomed our third foal by Little Kings Buck Outta Cyte (OC), our palomino Buckeroo son. He�s definitely consistent in what he produces! 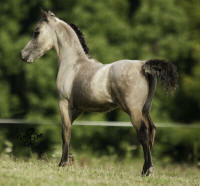 Another buckskin filly also! Again the long slender neck and awesome legs! OC already has 3 sons successfully winning in the show ring (one with John Eberth and two with Daniel/Peas Hill) so we�re hoping his offspring here will also have the potential to garnish some titles. A little background on OC: on the bottom side, his dam, Little Kings Champagne Supreme is sired by another legend, Komokos Little King Supreme, who was an anchor stallion at Little King Farm for many years and is a multiple National Champion producer. Additionally, many of his get have gone on to become National Champion producers as well. And there's more!! Little Kings Champagne Supreme is out of Cross Autumns Shavone, who is sired by JOHNSTONS GOLD BAR. Cross Autumns Shavone is also the dam of Mini Bits Shady Lady, the dam of ALVADARS DOUBLE DESTINY. 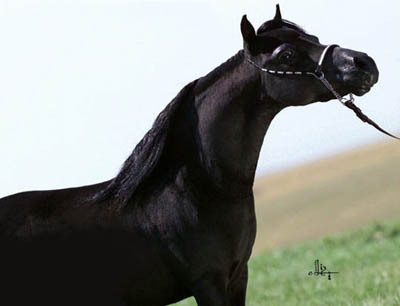 OC is a beautiful stallion and a wonderful example of line breeding at its best. OC is FULL BROTHER to Reserve World Champion, LITTLE KINGS BUCKEROO CAVALIER. This foals dam, April is sired by the Double Buckeroo National Champion and top ten producing stallion, Schuberts Bullets Painted Splendor, a 31 inch bay and white tobiano pinto stallion who is a son of Little King's Bullet Buckeroo, a 29 inch tall, six time National Top Ten, double bred Boone's Little Buckeroo son. Don�t stop there because April (the foals dam) on the bottom is a daughter of Lil Hoof Hollows Starrey Nite by Komokos Native Aid out of Lil Hoove Hollows Sterling Starlight a 2003 Top 10 Producer of Dam & 2003 Top 10 Mare & current foal. This is an outstanding double bred Buckeroo filly � and a Buckskin to boot! 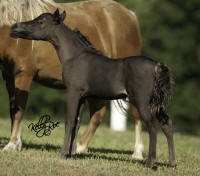 Our first ever Futurity Nominated foal and boy did we luck out! And a filly to boot! She's tiny, correct and very striking with her two blue eyes against her black face and her extremely tippy ears. She's refined and delicate and totally feminine. Her sire Bonus has an impeccable pedigree of who�s who in the miniature industry! His pedigree also carries Little Kings Son of a Buck, Little Kings Enchanted Lady, Johnstons Vanilla, Johnstons Gold Bar, Gold Melody Boy, Stouts, Dell Teras, Komokos Little Husseler, and Orion. Bonus has excellent breeding top and bottom in this tiny package - the well known and successful cross of Buckeroo and Scout!. Both his sire and dam were Reserve World Champions. Bonus' sire Little Kings Bonus Bucks holds champion titles and was owned by Stone Hill Farm until his unfortunate death in 2008. 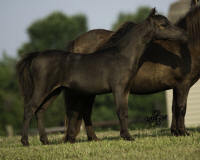 Bonus Bucks had 9 foals in his short lifetime and only two (2) were sons - of which we own one. Bonus had his first foal crop in 2009 and we are thrilled with what he produces. Bonus� first filly is now in England crowned with Champion and Supreme titles as a yearling. His 2010 filly is also overseas winning champion titles. This filly can do the same for you and put you on the map and cash in your pocket. Bella as we call her, is a very correct filly with long legs and a flagging trot. Her sire is double Buckeroo and her dam is a Patton daughter. Need we say more? The Patton / Buckeroo cross is a very successful one and she's no exception. Hesitantly offering her for a limited time $2,500. Now we�re talking! Born 4-10-11 with a canon measurement of 7.5� this black colt is fabulous and he knows it with his prancing and tail flagging even at a walk. He�s got some famous names and great champions in his background too. His dam is the daughter of Grosshills Velvet and Lace (a Rhotens Little Dandy daughter) who is the winningest mare in AMHA history amassing 317 halter points and so many other supreme and champion titles you can�t list them all. His sire is a buckskin Buckeroo son. Quite the combination in this little dude and it shows! Call me crazy but I�m going to start him at $2,500 until weaning so you might want to consider your 20% deposit to hold him. On 5-9-11 we welcomed our first foal by Little Kings Buck Outta Cyte (OC), our palomino Buckeroo son. Definitely not disappointed in what OC has produced so far. 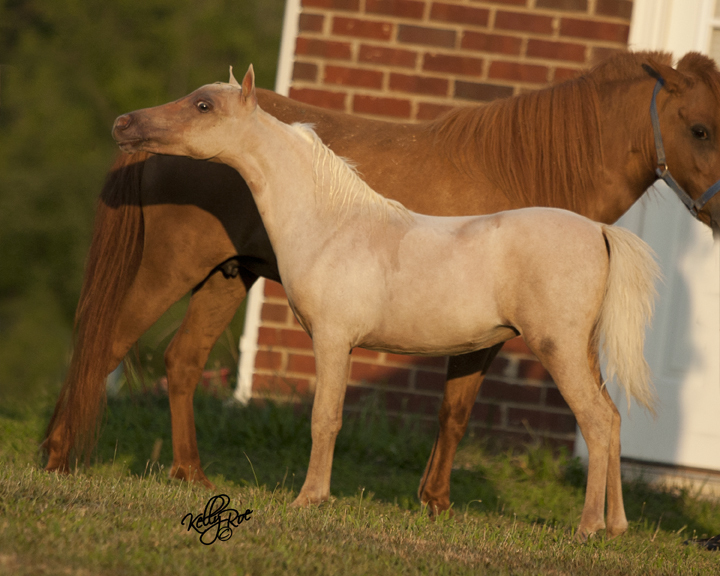 Tajah his dam is smokey black out of a Palomino mare and OC, his sire is a palomino out of a buckskin sire �. Not sure how this color crept in but we�re thrilled with him just the same! OC already has 3 sons successfully winning in the show ring so we�re hoping this son will also have the potential to garnish you some titles. Early assessment shows a strong shoulder, long slender neck and beautiful head on his straight conformation. Yes, we can tell all this already � some just stand out! A Buckeroo grandson on top but don�t stop there as his dam lends the triple Blue Boy blood and Black Majesty, who now resides in Australia - is a son of Gold Melody Boy. Tajah Blue, his dam, has a full sister that has won multiple world championships over several years (consecutively from 2004 to 2006) for Jones Mini Whinnies. I�m confident all these winning combinations in his pedigree give this colt the potential to go places and get noticed. 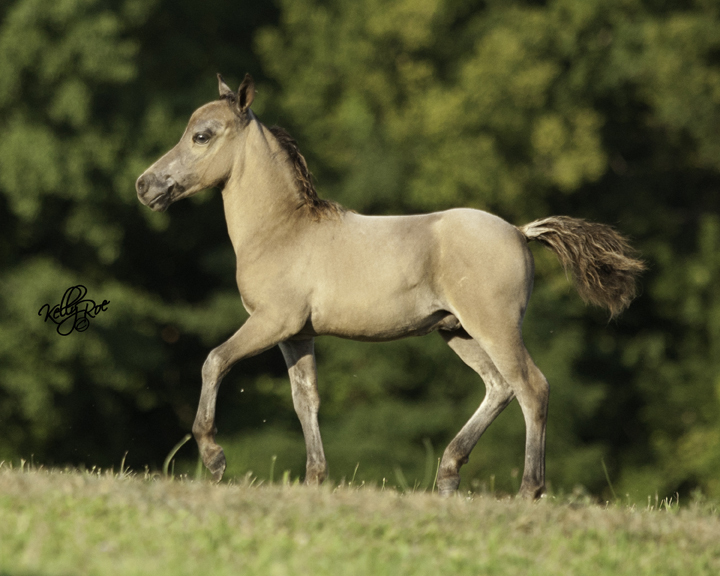 We�re pleased to present yet another Buckskin foal to carry on the Buckeroo legacy. 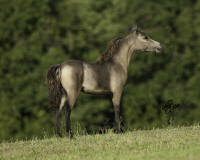 His sire is our buckskin Buckeroo son and his dam is a daughter of Little Kings Buck Armani. Buck Armani is sired by East Acres Golden Jubilee and a Buckeroo daughter, National Grand Champion Little Kings Buckeroo Dejavu. CoCo�s dam is sired by Little Kings Buck Echo making her double Buckeroo. CoCo has Gold Melody Boy on the top and bottom of her pedigree along with Komokos Teenie Jeanie top and bottom. This colt is royally bred. What a way to keep the legacy alive � outstanding little colt for your consideration. Born 4-8-11 with an 8� canon, this bay colt is unfolding nicely. His sire is a Buckeroo son who also carries Blue Boy on his dams side. His dam adds to his pedigree with Roan Ranger, Gold Melody and Johnstons Gold Bar. I�m expecting to be wowed by him when he�s clipped so take advantage of this special offering now before he�s weaned and I change my assessment of him. We chose his name because he was born the night the Government made their decision not to shutdown. Her dam carries two crosses to Rowdy and Egyptian King. Her sire �Rogue� is a tiny buckskin son of Hunt House Farms Rogue�s Native and Royal Oaks Expect to Impress. Affectionately called Precious, she is an "in your lap/pocket" horse and extremely affectionate. She has begun displaying mottling on her muzzle, around her eyes, underbelly areas etc. 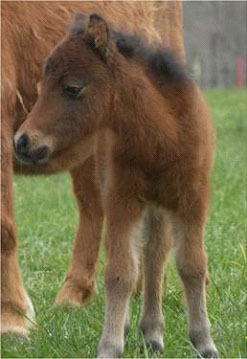 on the 2012 foal page . This photo is from August 1st 2011 straight from the field.